We could all do with a bit of motivation sometimes; a reminder to keep believing in ourselves and our capacity to do something of value. I am very fortunate that motivation comes when most needed. 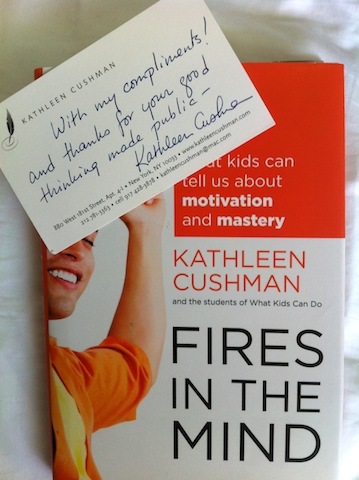 This is a book I received from @kathleencushman, the author. In it is a ‘with compliments’ card saying “…thank you for your good thinking made public”. I’ve previously blogged about this so won’t re-hash too much. This came early in my blogging career when I certainly didn’t assume my thinking was particularly good, or good enough to really be made all that public. Truth is, I started blogging for me – read more in “Reader, you are important to me“. For the most part, I still blog for me, as part of my thinking and learning process. However, I have come to believe in the power of getting it out there – good or bad! well-articulated or not. 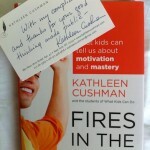 As an aside, I have read Fires in the Mind since that previous post and I can tell you that this book is gold. Kathleen’s work is practical as well as inspirational. It is practically a handbook for helping youth discover the values of mastery and develop skills accordingly. If you don’t trust my judgement (which is fair enough), perhaps you will @shannoninottawa in this post. Ordinary to you. Amazing to others. This is a gift from @whatedsaid who invited me to join the Inquire Within community. She gave me the link when I voiced my doubts of being good enough; I was very touched. The video itself is powerful, for sure as evidenced by the replies and kudos I got for tweeting the link. It is even more powerful as a targeted gift; Edna honestly believed it was true for me – I’m still hoping she’s not somehow deluded. So I write this post not to say that my thinking or blogging are any better though I certainly hope I’m improving. The point really is to show Kathleen and Ed that their gifts have kept on giving because in my ordinariness, perhaps I have been amazing after all. So then, my dear reader, be inspired enough to be amazing in your ordinariness….and generous enough to give this gift to your peers and/or students. The rest will be communicated privately! Thanks Edna. Now I’m curious. can’t wait. What a wonderful and touching post! This is exactly what I needed to hear – that is the wonderful thing about reaching out…people reach back! Thank you for having the bravery to share your inner thoughts, it is often difficult to be so open in such an open forum (for me anyways).